Fast Casual is a love letter to Panera Bread. It’s nine songs about bread bowls, book clubs and salad. For years, Panera Bread has provided the touring band with a healthy place to eat lunch, drink coffee and use the Wi-Fi. Fast Casual pays homage to everything Bryan and Neil enjoy about their favorite restaurant chain. 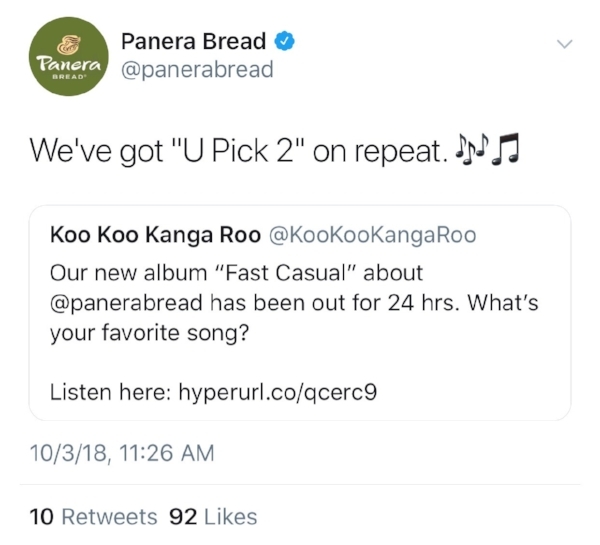 Panera tweeted about the album! We’re a touring band and we make our living by playing live events all over the place. That means for weeks at a time we dine at restaurants and bars. Those meals can be wonderful and delicious! But most of the time we’re looking at greasy, fried food that is best consumed in moderation. Over the last few years we’ve made a point of dining at Panera Bread when we’re on the road, and with over 2,000 locations across the county, they’re easy to find! Koo Koo Kanga Roo is a dance-a-long comedy show by Bryan and Neil, two friends who set out to experiment with live music and make it more fun. Armed with nothing more than an iPod, two mics and some gold sneakers, Koo Koo Kanga Roo puts on an all-ages dance party that invites everyone to join in. Whether you know them from "brain break" videos in your classroom, the Vans Warped Tour or a late night bar show, you’ve probably gotten sweaty dancing to their jams at some point.